December | 2012 | ride. travel. live. A number of these are Chicago landmarks, as they should be. By and large, these are early structures of Adler and Sullivan, all except the Charnley House completed by 1886, intended mostly for their middle- and upper middle-class clientele. They are simpler structures than their larger commissions, and much of the detail is in the interiors, with beautifully decorated stairways, stencilwork, balustrades, newel posts, and the like. From the exterior, the majority come across as being conservative, even severe. These days, they’re quite rare, with only a handful remaining in Chicago. Up until the mid-20th century, a large number of them stood in and around Bronzeville, before much of the area was razed in the name of urban renewal. Here’s a tour of the structures, four of them on the North Side and two on the South Side. 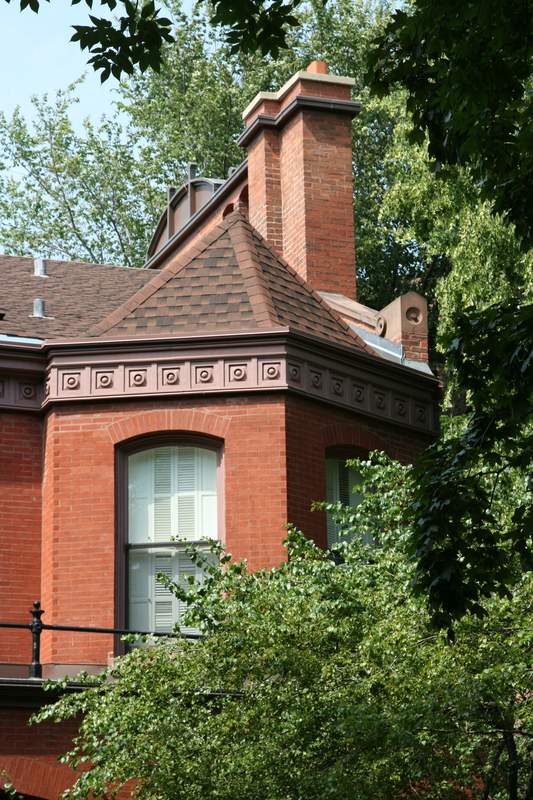 Mannheimer house (1884): This one is whimsical, distinguished mostly by the semicircular, textured front. Around the corner is the Halsted House (1883): This freestanding house is on a spacious lot, and is severe and simple in character. The top begins to have a bit of fun, though, with experimentation around the chimney and the dormers. 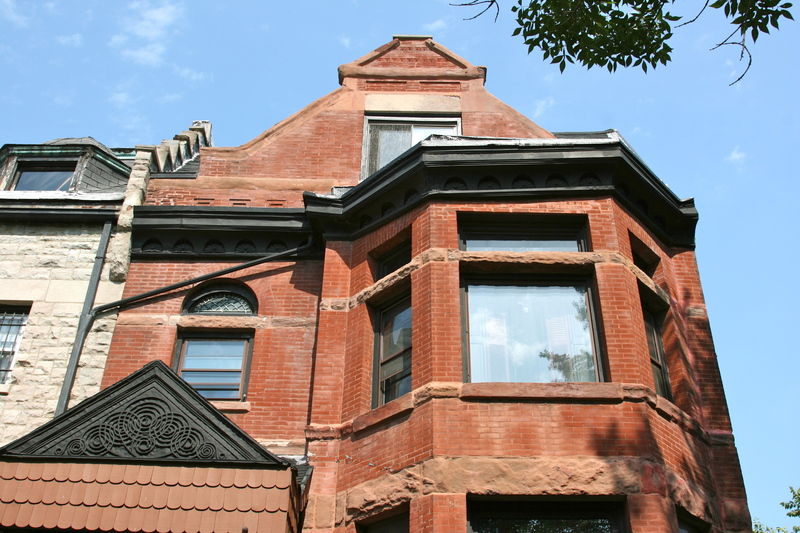 Row houses for Ann Halsted (1884-1885): These are the only row houses designed by Adler and Sullivan, just as Sullivan was honing his architectural and decorative skills. Charnley House (1892): This is probably mostly the work of Frank Lloyd Wright. The exterior bears the hallmarks of Wright, with the long Roman brick and emphasis on horizontality. Given that by the early 1890s Adler and Sullivan were busy with their skyscraper commissions, and that Sullivan had little desire to do residences, most of the work was probably left to Wright. 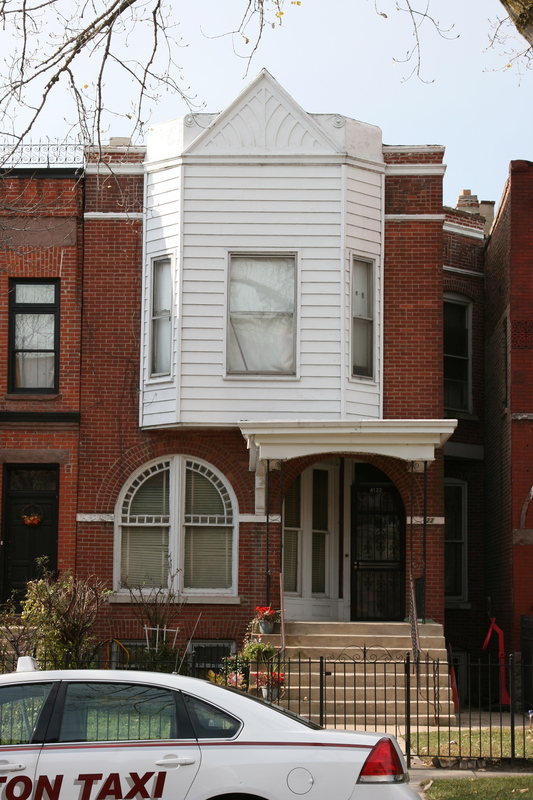 Two houses remain on the South Side, one in Oakland, and one in Bronzeville. Both managed to escape the obliteration of entire blocks and neighborhoods in the mid-20th century. Richard Nickel’s extensive documentation of the neighborhood reveal a vital community, but badly decayed buildings and clear neglect. The Sullivan buildings all stood out for their architecture, but were clearly on their last legs as the neighborhood was being obliterated around them. They had also been extensively modified, many were missing their cornices, painted in appalling colors, and had not been properly maintained. 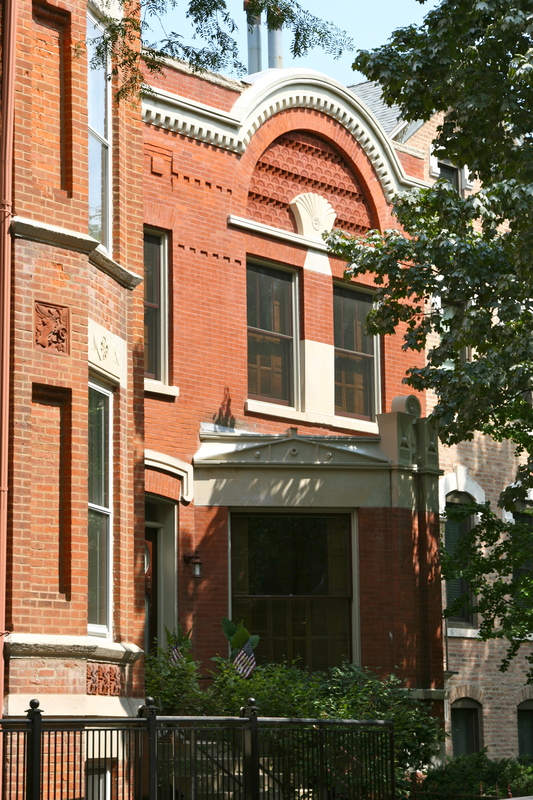 Eliel House (1886): Officially a Chicago landmark, probably because of its status as a rare Sullivan house in a neighborhood that was nearly torn down. This is one of Adler and Sullivan’s simpler structures, and heavily modified with siding on the bay window. Deimel House (1886): Again, the Deimel house is restrained, and most of the architectural detail is inside. The outside is notable for the entryway. And it’s for sale! 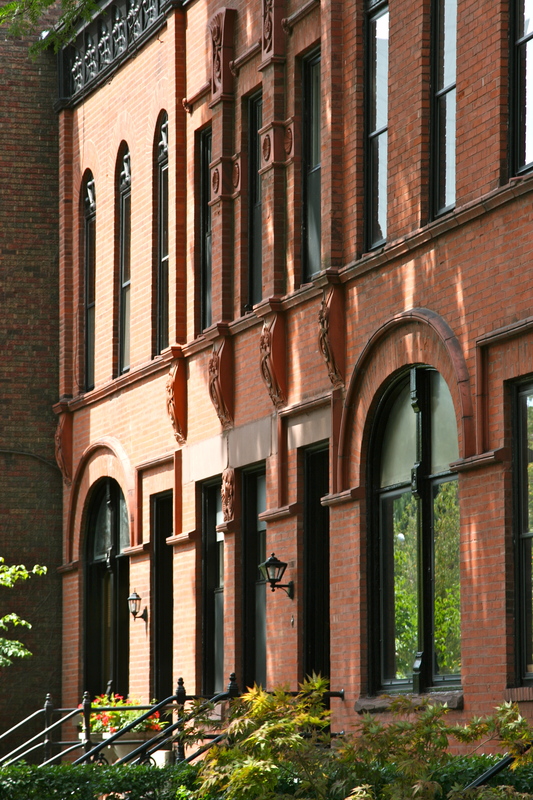 Down the street are Wright’s Roloson row houses, which have Sullivanesque decorative panels. I believe that the sole remaining Sullivan single-family house outside of Chicago is in Madison, WI, now a University of Wisconsin fraternity. There is also Sullivan’s little-known Tusculum College structure in Tennessee, and his badly damaged vacation house complex in Biloxi, MS. I have not visited either of them yet.